I am passionate about Youth At Risk and have I worked for 5 years with The Prime Ministers Youth Programme through Mangere East Family Services facilitating my seminar modules. My seminar modules are designed to stimulate, reward & educate rapidly through self-esteem & working on the students personal presentation and soft life skills that have been written to compliment current youth development services available. If you require content please inquire about implementing my modules under your current system. The following modules can be broken down from a week long day course to a one day workshop or a half day seminar depending on the participants requirements. It gives me great pleasure to be able to provide feedback on behalf of the clients that attended the ‘Self-Esteem’ workshop that you delivered at our Panmure Campus, East Auckland on Tuesday 7 December, 2014. Our Solomon Group clients were a mix of Young Parent Payment (YPP) and Youth Payment (YP). A rich and thorough programme was evident and thoroughly enjoyed by the very fortunate females on the day. “This is a great opportunity, is this for real? I cannot believe it I feel spoilt, this will help me big time I have learnt some skills that will support me in the future This is special and it makes me feel confident. I feel like a lady and have grown within a day The tips and skills will help my whanau” Bianca, I was working not far away from the room that you facilitated in that day and could see that the clients looked really comfortable, at home and certainly looked and felt ever so special. I personally think that your ‘Self Esteem’ workshop is a stunning and meaningful way to support our young people in so many rich ways. Visually, physically, mentally, and spiritually the very tools that you have imparted to our young leaders has been very uplifting for them. I was very disappointed from our side that we had a big majority of the list withdrew at the 12th hour. I was motivated to ensure that I have 100% attendance. For obvious reasons this was for the betterment of our attendees and to not disappoint the hard work that goes in behind and in front by yourself and support facilitator. I believe that your workshop would benefit other contracts that Solomon Group run. For example we have been offering and continue to offer a programme called Whanau Ara Mua to currently 150 full time students. The kaupapa of this programme is to support and develop parents and caregivers. It is a Level 2 Certificate in Family Learning and Child Development (120 credits). The Values incorporated into Whānau Ara Mua include Whakapapa (establishing and recognising identify), Whānaungatanga (acknowledging the whole person and the importance of family relationships), Manaakitanga (expressing hospitality, respect and care for others) and Ako (learning in the whānau that acknowledges mutual obligations). These clients would really value and benefit from your programme. Generally, your programme will benefit just about any nook or cranny in the community. TYLA Youth Development Trust works alongside young people who are offending, there is likelihood that offending will occur and implement early intervention models. TYLA works alongside the young person and their families to eliminate or reduce offending behaviours by offering Social and Youth Work Practice in homes, schools, mentoring, referrals and programmes. 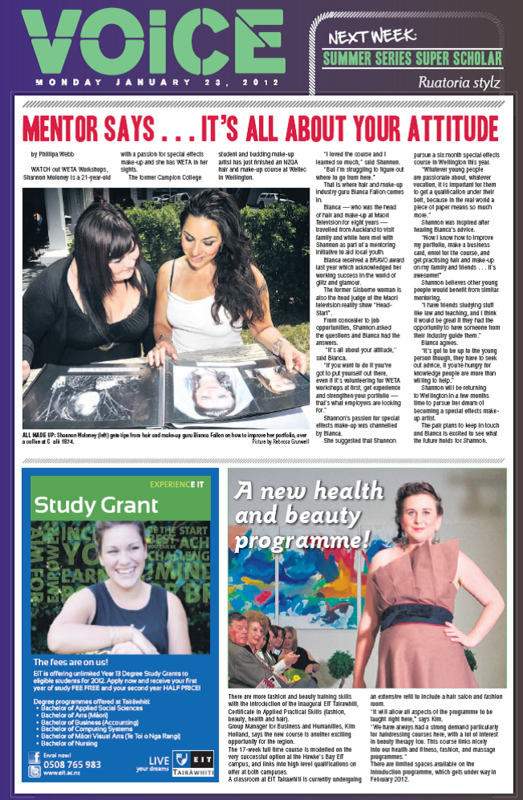 TYLA Otara had the privilege of participating on the Beauty Hair and Makeup workshop on the 5th November 2014. There were eight young women who attended; seven reside in Otara and one in Papatoetoe. 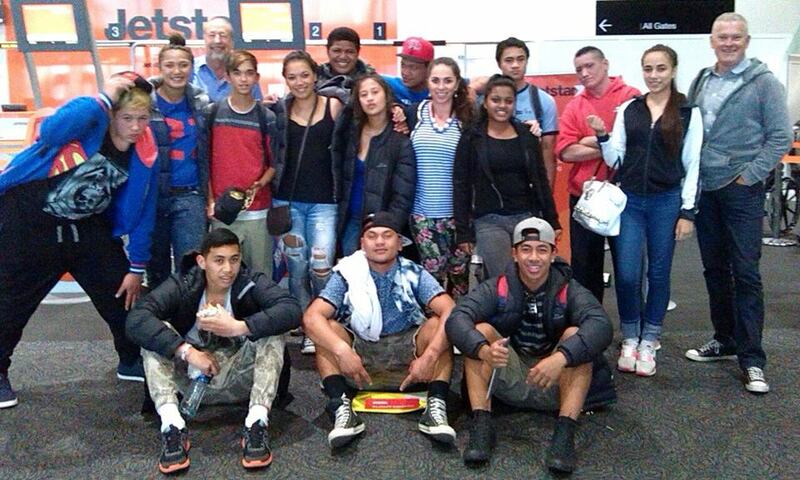 They attend the local colleges and Alternative Education in Manukau. I received an email describing a dynamic programme that was available to young women in the South Auckland region and thought what a great opportunity for our Ladies. This programme offered the tools I believed could increase the resilience for the participants. 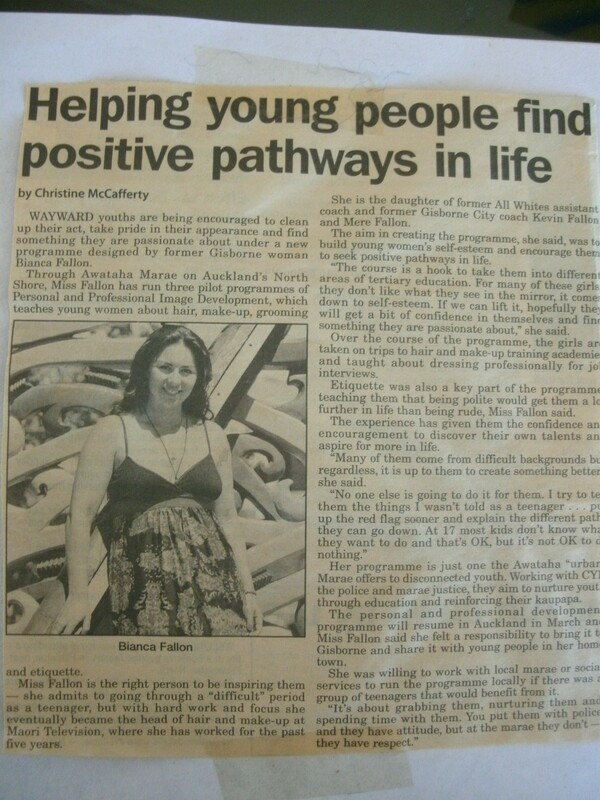 I would like to thank Bianca Fallon for sharing her unique gift with the young women of the Otara area. Bianca was able to capture her audience (including us adults) and hold their attention all day. I liked how she structured the modules using a holistic approach, health and wellbeing and makeup and hair care. Bianca’s step by step approach to educating the rights and wrong ways of hair and make- up and looking after our bodies was extremely helpful as some of the girls were beginners and others adorn themselves daily. The resource work book was helpful and was full of useful information. The products given at no charge to TYLA or the families was amazing, the girls were very cheerful going home with their gifts. Thin Lizzy, minttttt. Faa, she’s pretty. A mother of a girl was anxious about her daughter participating because she is very shy, lacked confidence and did not mix in well. When the mother picked her daughter up she was pleased that her daughter had a good day, got on well and was happy. The mother could not thank us enough. The eight young women plus myself and a Social Work student from Manukau Institute of Technology who was on her practicum with our service completed evaluations. I would like to acknowledge those that funded this programme. Without your contribution it would have been unlikely that these young ladies would have had attended anything like this. This programme has encouraged our TYLA ladies of South Auckland to take pride, look nice, experiment with their looks, and take selfies but most of all it has given them new understandings of, who they are. I would like to see the funding continue to make a difference for our young people. Bianca, thank you once again for your assistance. Thank you so much for giving up your time and coming over the bridge to give us such a professional and informative presentation on Thursday night to speak & implement a makeover along with Dr Frances Pitsillis & Ani Wilson, we were excited to have three interesting women to speak on topics we are all intrigued in as women. We did appreciate your expertise and effective style of informing us on effective methods of beauty methods and practical ways to gain the best look. Your wealth of experience showed and we did appreciate you supporting us in our endeavour to give women and young women a better way in life.